Sandium Heating and Air Blog: Is DIY HVAC a Good Idea OR a Bad Idea? Is DIY HVAC a Good Idea OR a Bad Idea? Is do-it-yourself HVAC a good idea? It is very important to understand that DIY HVAC is in some cases a great idea, but in most cases, such projects can be daunting and are not for everyone. Let's look at what is involved in a few of a lot of these projects and then decide if you are up to the task. Air Conditioner or Heat Pump unit replacement: This usually involves removing the existing outdoor condenser or heat pump and replacing it with a new unit. That sounds easy, right? Well, it is, if you know what you are doing and have the proper tools to do it. 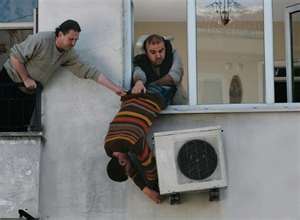 To remove the existing unit, you, by law, must evacuate the existing refrigerant from the system. This requires two things that most of us do not have, an evacuation pump that removes and stores the refrigerant and a CFC Refrigerant Certification. Ouch!! Now what do you do? Because of a lot of these restrictions and rightfully so, as the handling of refrigerant chemicals can be dangerous because of extreme temperatures and high pressures that can harm humans if subjected to either, and the ever present concern of releasing the CFC related chemicals into our atmosphere that are illegal to expel, it would appear that you are not going to be able to do this project yourself. But all is not lost. What you can do, is purchase your equipment from a reputable company that specializes in making HVAC equipment available to homeowners. This will be the most important step you will take. In many cases the money that you will save will be so dramatic that you will wonder exactly why you have not done this before. Next, you can prepare the site location new equipment. This may include grading an area outside of your own and installing a new pad, either prefab or poured concrete. You can also run and secure new refrigerant lines set between the outdoor unit and the coil. Because you are not directly handling refrigerants, you are allowed and most likely capable of doing this portion of the job. Depending on building and electrical codes in your area, you may be able to run electrical connections and have those ready for qualified professional connection or possibly make a lot of these connections yourself. You can purchase and install a new thermostat if needed as well. As you can see, there is plenty that you can do yourself that will save you money in the end. When the time is right, hiring a local skilled professional to complete the project is the best option and may be the only option. But remember that the money you have saved by purchasing your own equipment and the pre-work that you have done yourself will pay big dividends. From water damage kansas city If you need any type of water damage restoration or water removal taken care of, then you should not think twice to use Local Water Damage Pros to fix the water removal. water damage kansas city also know how important it is to fix the problem virtually as early as it starts.